So...the cat is officially out of the bag...which means I've got some exciting news! I am so incredibly pleased to announce that I, Miso Crafty Knits, will be a vendor at this year's Fibrations in August!! 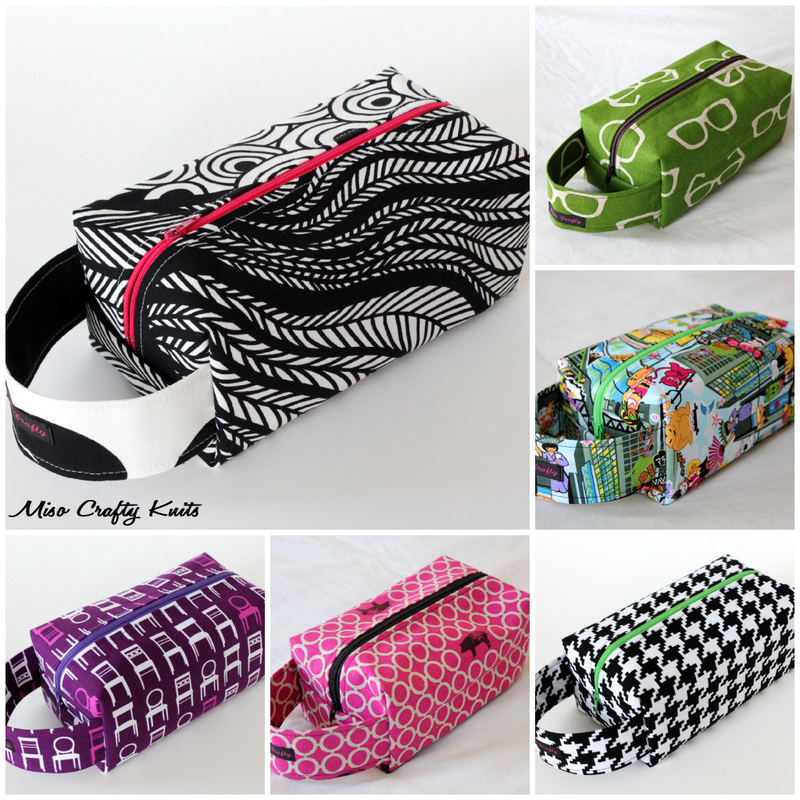 I'm going to have a tiny little booth and will have a selection of both small and large zippered box project bags, drawstring bags, a few small zippy pouches, as well as a few other goodies. I will also be donating a prize for the Toonie ($2) Fundraising Raffle. You're going to have to wait to see the little package of lovelies that I'm putting together. Mainly because I have yet to sew up the goodies...just know that a project bag will for sure be a part of it! 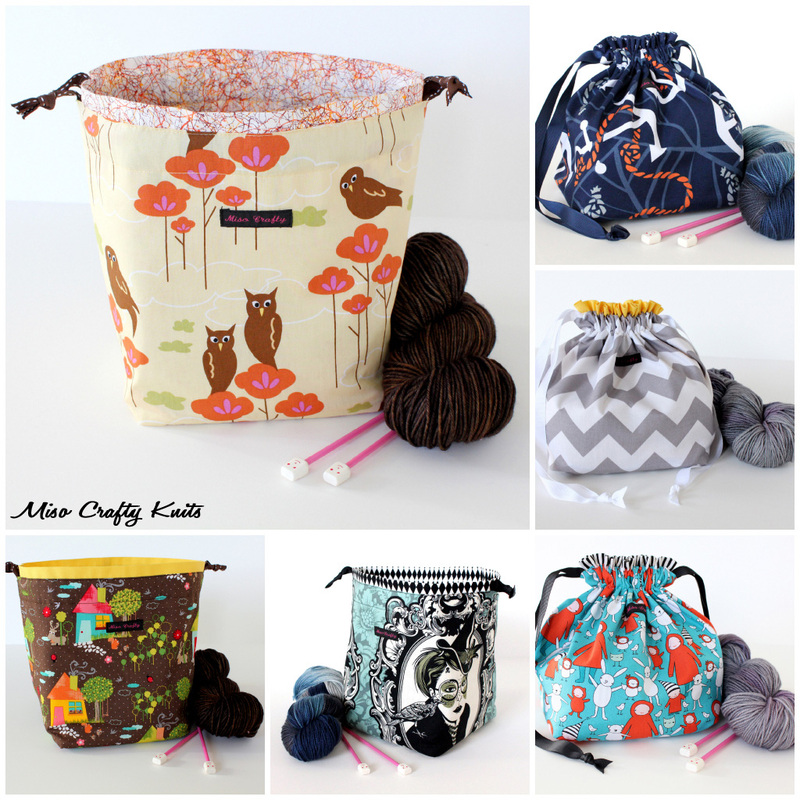 How awesome would it be to score a project bag for just 2 dollars? Um, I think that would be atomically fantastic! Please note that the bags shown below are just for eye candy purposes. These specific bags have already been sold and not all fabrics represented in these photos will be available. If you live in the area, or if you're planning on visiting the island on August 18th, I hope you will check out Fibrations. And if you do, I hope you will stop by my booth and say hi! For more information about the event and for a complete list of vendors, check out the Fibrations website. I need to get my hands on one of your project bags at some point! Fingers crossed I get a job soon, yes? :) And how fun that you get to be a vendor! Yayyy! Don't forget to post a recap!!! Thanks Sheralynn! :) Hopefully I'll have a chance to take photos at one point during the event to do a recap!! Now you know why I can't get start on those quilts we talked about...I've got A LOT of sewing to do to get ready for this event! That's awesome news! You really use such beautiful fabrics for your bags, so I'm sure you will do really well. Good luck with all that work! That is awesome Melissa! I wish I could get to it but I'm getting married the weekend after and have family arriving then. It was a great event last year though. I have to get my hands on one or your project bags, the patterns are so fun. I'll be keeping an eye on your Etsy store! Oh how exciting! I've just signed up to do a baby's and kids market to promote my new little business doing lolly/dessert buffets and styling for events. I'm so nervous but so excited! Wonderful post altogether, you simply gained a new reader. What would you suggest in regards to your put up that you made some days in the past? Any positive?